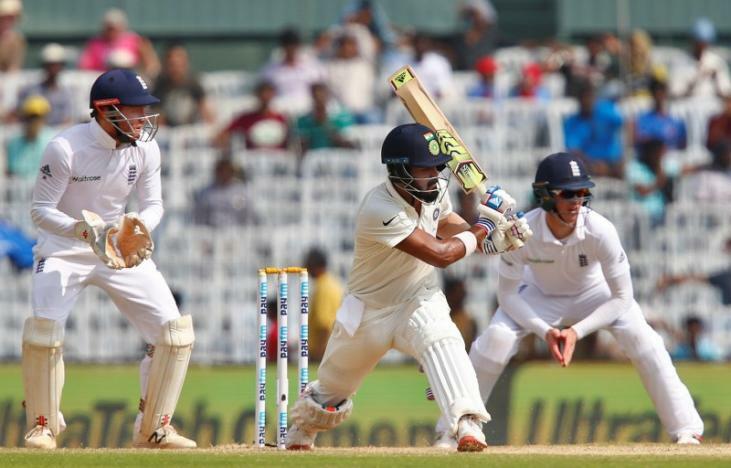 CHENNAI – India’s makeshift opening pair of Lokesh Rahul and Parthiv Patel struck fifties to lead the hosts’ strong reply to England’s first innings total of 477 on day three of the fifth and final test on Sunday. On a track getting increasingly easier to bat on, Rahul and Patel combined to forge India’s first century-plus opening stand in 32 innings to help the hosts reach 173 for one at lunch. Rahul braved a knee injury to remain unbeaten on 89 as the openers scored briskly against the English bowlers at the MA Chidambaram Stadium. Cheteshwar Pujara was batting on 11 at the other end, with India, who have taken an unassailable 3-0 lead, still 304 runs behind. Resuming on 60 for no loss, Rahul and Patel negotiated the English attack with consummate ease. Replacing injured regular keeper Wriddhiman Saha after the second test, Patel kept wickets for over 157 overs and then returned to partner Rahul after opener Murali Vijay sustained a shoulder injury which prompted him to bat lower. Rahul was particularly harsh on debutant Liam Dawson, twice stepping out against the left-arm spinner to hit him for sixes. Rahul took two runs off Stuart Broad to bring up his second fifty and the opener with an excellent fifty-to-hundred conversion rate remained on course for his fourth test century. Patel pulled paceman Jake Ball and ran two to register his sixth test half-century, second of the series.